On Tuesday, I beamed in via Skype for my very first Suffering Succotash book club event. It was awesome. The book club was in Boston, finishing dinner and wine, and I was in California, putting on makeup and trying to prop my laptop at the perfect angle so as not to have the group talking to my chins the entire time. We talked about the book, we discussed picky eating, and I doled out what insight I now have on the book writing process. I also talked up my experience with Perigee Books (my publisher) and Jeanette Shaw (my editor extraordinaire), and the book club attendees got to hear the story of how a particular chapter was, at one point, three times the length of what actually ended up in the book and went through a draft stage that appeared to be written by a crazy person. And apparently I Skype like I write, because the postmortem from the group was that I came across as a natural at both: "you were great and everyone couldn't believe how much fun you were and that you were just exactly like they thought you would be after reading the book!" 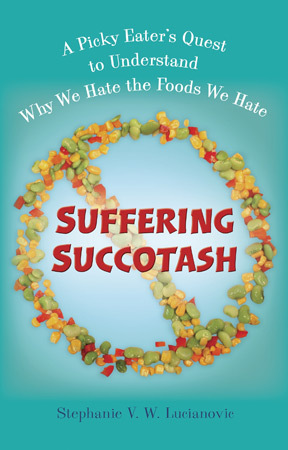 It was a blast and I would do it again in a heartbeat, so spread the word: choose Suffering Succotash for your book club and I will Skype in and have a little chin wag with you about whatever you might want to talk about. I'll even demonstrate picky eating cooking methods or recipes, if you want! Reach out and book me: @grubreport or SVWL22 at gmail dot com.